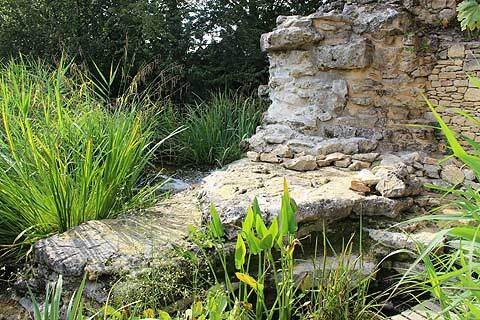 The Panoramic garden of Limeuil is found at the top of the village of Limeuil in between Le Bugue and le Buisson de Cadouin. 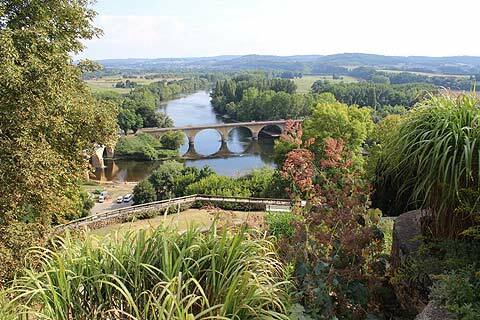 The garden occupies a fabulous position overlooking the confluence of the Dordogne and Vezere rivers. The gardens are entered by a medieval chateau though in reality this looks like a large and not especially interesting manor house. Behind the chateau is a pleasant tea garden offering refreshments including some unusual flavours of ice-cream including fennel and hibiscus. 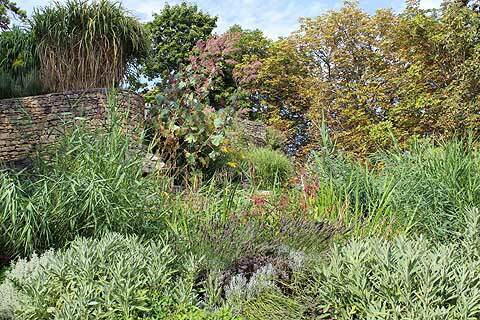 The tour of the garden then begins with an area laid out in the manner of a medieval garden and filled with aromatic plants and herbs. The garden then opens out into a park with some trees of more than a hundred years old. There is a giant sequoia amongst them. 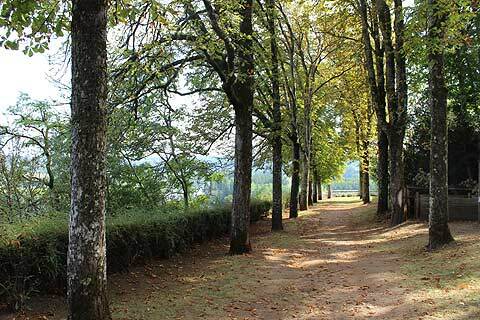 The garden path then takes you to a view point over the confluence of the rivers Dordogne and Vezere. Lovely stone arched bridges meet to form a long L-shaped bridge across the rivers and making for a very picturesque view. You can also see down over the roofs of the village of Limeuil, classed as one of the most beautiful villages of France. 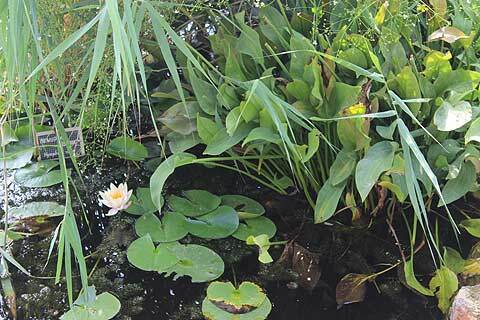 There is a nice water garden with a pond surrounded by some pretty planting including lots of mediterranean style planting such as salvias, sage and lavenders. Another area of the garden is a kind of mini botanic garden with plants carefully labelled and organised in rows and shaded by a metal structure covered in climbing plants. 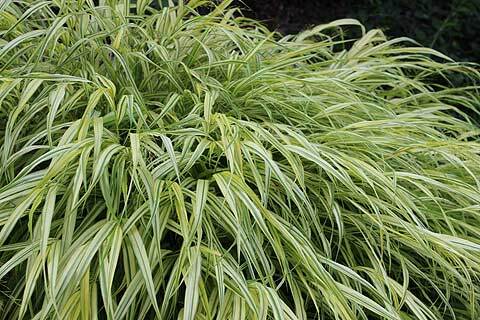 All in all the garden has some nice features but really it is its splendid position that makes it most worth a visit. During the summer there are various workshops that take place including clothes dying using natural plant dyes, and willow weaving. As well as the café there is a small shop selling soaps, gifts and gardening books and there are a few plants for sale too. Les Jardins Panoramique de Limeuil opening hours. April, October and beginning November: 10.00 to 18.00 every day except Saturday. May, June and September : 10.00 to 18.00 every day except Saturday morning. July and August: 10.00 to 20.00 every day plus craft workshops from 14.00 to 18.00. A visit costs 8 euros for adults, 5,50 euros for 6-18s and is free for under 6s. The lovely village of La Roque Gageac which is a little further along the Dordogne river has had so many exotic plants such as bananas, bamboos and palms that the whole village is like one big garden. It is also classified as one of the most beautiful in France. Near to here also is the medieval village of Domme which is home to the pretty Jardins de l'Albarede.